Firefighters worked to contain the fire and allow wax to burn out. The Durban fire that extended into its third day on Sunday, which had started on Friday morning was successfully contained, officials say, Northglen News reports. As the inferno continued into a third day, pictures on social media showed diminished plume emanating from the site. 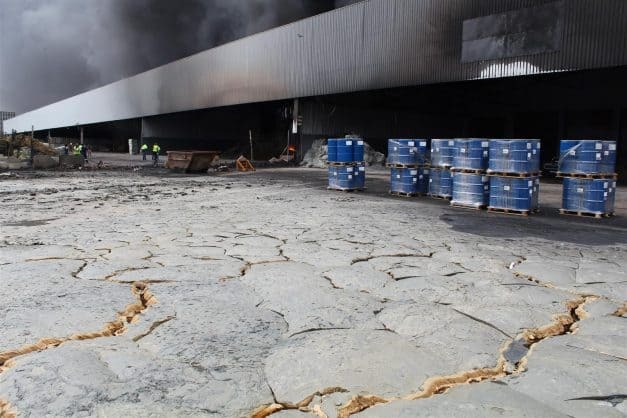 Firefighters successfully removed all the highly explosive material from the Rossburgh warehouse yesterday. Hay bales and ammonium were stored in the building, and firefighters with warehouse employees, worked furiously through Friday night to separate the flammable materials from the flames. Saturday saw the hay and ammonium removed from the building, by then it was not clear when the flames were going to be completely extinguished, but firefighters worked to keep the fire contained and allow the wax that is already on fire, to burn out.